The last few days have seen a number of incidents across Greece. Fascist attacks, hunger strikes, rival groups of protesters clashing and thousands of people having their electricity cut off are just some of the news stories from one day. There are days in Greece when a number of 'small' incidents happen at the same time and together paint a picture of life in the crisis. The 24 hours between late Monday 8th to Tuesday 9th of April was one of these times. If you looked through Greek media sites on this day a number of small news items would have caught your attention. You would have seen reports of a joint fascist-police attack on a squat in Patra, Roma and fascists coming face to face in a hospital, pro and anti gold mine protesters clashing in the north, news of a hunger strike in immigrant detention camps and 30,000 people a month having their electricity cut off. 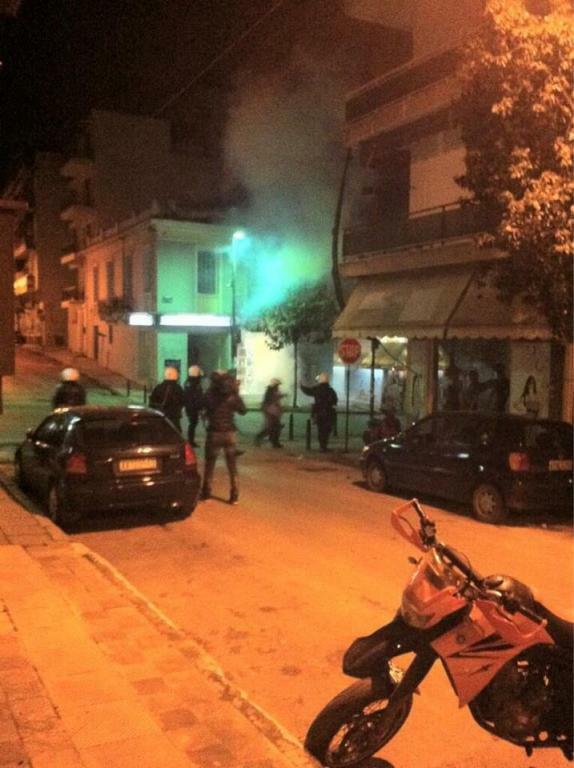 On Monday evening Golden Dawn(the party of the far-right) and squatters clashed in the western city of Patra. According to reports the clashes started as a number of people from the Maragopouleio occupation passed a hang out of fascist supporters. The initial attacks by the fascists were pushed back and police units soon arrived. The police units and fascists worked together to attack the occupation with stones, tear gas and stun grenades. The police-fascists kept the building under siege for a few hours until under pressure from people who had gathered in support of the occupation they retreated. A few hours to the south in the city of Kalamata Golden Dawn members, including one MP, visited a hospital in order to check the nationality of nurses working there. This isn't the first time party members have attempted to find foreign nurses in Greek hospitals. During the Golden Dawn visit a young Roma man was being treated in the hospital, possibly as a result of a racist attack, and a scuffle ensued. They were separated and a complaint about the Golden Dawn presence in the hospital has been made. In northern Greece anti-mining residents clashed with potential workers at a controversial gold mine in the area of Halkidiki. The brief fight between residents worried about the damage to their environment and people wishing to be employed by the mining company was broken up by the police. This incident is a clear example of social cannibalism as different parts of the working class fight each over of the scrapes left after years of crisis. In addition to this on the morning of 10th April there was another police raid on the village of Ierissos in relation to anti-mining activities. Police have been conducting an investigation in Halkidiki and previously have invaded the town in full force to arrest suspects. During the early hours police smashed their way into two houses and took away two people for questioning. In response local residents gathered and attacked the police station in the village. The building was empty as the arrested had been taken out of the village so the residents sacked it and left. At the time of writing protests against the police raids are being held around Northern Greece. Recently the anti-immigrant operation 'Xenios Zeus', which involves large police patrols searching for immigrants in city centres, has continued. So far this operation which has been on going for several months has seen tens of thousands of people detained and thousands transferred to prison camps. There the people must wait to be deported or are just imprisoned indefinitely. Inside these camps 2,000 people have reportedly gone on hunger strike with some reportedly having attempted suicide. The strike started at the camp for immigrants at Amygdaleza in Athens but has since spread nationwide. As part of the rounds of austerity measures a tax was placed on electricity bills making them a lot more expensive. Originally only for one year the tax has been maintained. Non payment means people having their electricity cut off. As five years of recession and three years of Troika rule bite around 30,000 people a month are unable to pay the bill and are having their electricity cut off. All of the above stories can be found on Greek media sites from just one 24 hour period. None of these stories were large headline pieces just small stories as part of the daily news feed. The rest of the news was taken up with gloomily economic data, meetings with the Troika, more likely sackings and strike announcements. It's days like this that bring home the reality of life in Greece though this day was hardly an exception. This is normal now. In the detention centres were the hunger strikes are taking place the media are reporting a riot on Wednesday. After poice officers beat a detainee fights broke out which led to 47 arrests being made in the camp. In Ierissos police have suspended operations after the attack on the police station this morning.